Several individuals attempted to enter through unlocked companionway at 0300 HRS - owner yelled and drove them away. Reported to the police who were responsive and informed the owner of vandalism to several other boats in marina 10 days prior. Two men swam out to a dark boat and attempted to steal articles of value and an unsecured dinghy. At 0215 hrs the owner was awakened and chased the would be thieves off. There was no damage and nothing was taken. A report was made to the marina, port captain and on the VHF net. A Canadian flagged monohull anchored off of Playa Bibijagua on the north coast of Isla de la Juventud was boarded overnight while owners slept. When they awoke in the morning, their life sling, cockpit cushions, dock lines, sunglasses and other miscellaneous cockpit paraphernalia had been taken by persons unknown. No police report was made. Local advice is to be extremely vigilant when anchoring near popoulated areas. During the night, police stopped/apprehended a suspect carrying suspicious items in his car. They posted pictures of the items along with a photo of the suspect and his driver's license on the Luperon Cruisers Facebook page. The items were not immediately recognized so a search was made of unoccupied yachts. A caretaker of a sailboat whose owner was away discovered that the locked yacht had been broken into and ransacked and identified the items as belonging to that boat. Charges were filed by the caretaker on the owners behalf, and the items were returned to the yacht. Thieves broke into an unoccupied but well locked yacht thru a deck hatch, damaging the hatch. The minder/caretaker discovered the theft the next morning. A stolen dinghy had been used to transport the goods and it was recovered. A report was made to the police, coast guard, port captain, the Puerto Blanco Marina, the tourist office and on the VHF net. CSSN NOTE: In reponse to the recent increase in thefts and boat burglaries, on November 14, 2019, stakeholders in Luperon met and roles/jurisdicitons were clarified, including correct crime reporting procedures. To enhance the security on the water the Navy comandante from Puerto Plata reinstated a patrol boat in Luperon bay with immediate effect. Initially, provisional equipment will be used, but a bigger patrol boat in association with a small patrol boat are expected. Locally, the Navy (call name: Richard) can be reached on VHF channel 68 24/7 in case of emergency. The National Police indicated that a 911-call will activate the patrols around the bay at all times. While the owner was asleep on board, the thief boarded the unlocked boat and stole $150 US cash. Computers and phones were not taken. Footprints were seen on deck in the morning, no police report was made. Owners left their yacht on a mooring for 3 days for inland travel. On their return they found a deck hatch that had been left closed but not locked was open and that the cabin had been ransacked. Only cash (which had been hidden) was taken. A report was made to the police, coast guard, port captain, the Puerto Blanco Marina, the tourist office and on the VHF net. An unoccupied trimaran on a mooring in the bay had its primary mooring vandalized (released) and the in the water backup/secondary anchor and rode stolen. The boat went adrift and had damage to its stern mounted radio antenna as it struck another yacht before eventually grounding itself in the mudflats. Both yachts had minor scratches. The owner/captain made a report to the local police. A yacht was tied to a mooring in Luperon Bay for a few hours before the owner went ashore. Vandals released the yacht, and removed all lines from it and the mooring itself during daylight hours. The yacht was seen adrift, an emercency VHF call was made and the yacht was recovered undamaged . No police report was made. At approximately 0300 HRS the crew of a yacht on a Marina Zar Par mooring was awakened by a masked intruder, who had entered the unlocked yacht while they slept. He spoke Spanish (which the crew did not understand), threatening to tie the crew up. He displayed a knife but did not harm them while he searched - taking cash, a watch, a cellphone and a bottle of rum. He departed in an unpowered boat. The crew reported the incident to the marina security staff later that morning, and also made a report to the police and port captain. They were informed this was the 3rd incident of this type at this location this year. CSSN NOTE: CSSN has received firsthand reports for 2 of the 3 assaults, but no details about this third incident. If you are, or know those victims, please encourage them to make an easy online report, using this LINK. Owners of a yacht berthed on the outside dock at Marina Zar Par awakened to a masked intruder at their bedside. He spoke only Spanish (which they understood) smelled of alcohol and was dripping wet. He had gained entry thru the unlocked companionway. A brief struggle ensued, he demanded cash and jewelry, which was freely given. The intruder tied both crew up holding a knife to the woman’s neck. He held his hand roughly against her mouth to silence her causing minor injuries, which were later treated by a doctor. After he departed, the crew managed to untie themselves and reported to the Zar Par Marina Security office. The security team provided immediate assistance by calling the police, who arrived promptly, and in gaining medical treatment for the woman. A formal report was also made to the Coast Guard the next day, and the police are investigating. CSSN wishes to thank our information sharing partner, Noonsite, where the victim’s detailed account was first published, read it HERE . At 0230 owner went on deck and discovered that the dinghy painter had been cut. The thief had been very quiet, neither of his two dogs had been disturbed. He heard an outboard in the distance that sounded like his. Radio calls (68/16/09) to authorities were not answered, but another cruiser responded and helped with a search. At 0330 the dinghy, minus its 30HP outboard was found adrift off the outside beach. Tire tracks and drag marks indicated the outboard was stolen with the assistance of a vehicle. No one was on the beach at this point, including members of the Commandante’s squad who claim to patrol there from 6PM to 6AM. The next day a report was made to the police, the Commandante’s office, and on the local VHF net. While the crew was ashore during the evening, a swimmer broke in through a hatch and stole a laptop, iPhone, Iridium satellite phone and other items. The thief used a plastic storage box from the yacht to carry away the goods. A police report was made. A cruiser was awakened during the night by the sound of a small boat bumping against the hull. He yelled out then grabbed a spotlight and went on deck to investigate. The dinghy was on davits and locked to the yacht, but now had an empty canoe tied to its bow. The boat and surrounding area were searched with lights, no one was found, and nothing was missing. The following morning the Navy stopped by to retrieve the canoe and inform the cruiser that they had picked up a soaking wet man onshore the previous night. Apparently the thief was looking for an outboard/dinghy to steal and he was interrupted, and jumped into the water and swam to shore rather than risk a confrontation. A report was made to the Port Captain. All tools being used for repairs. Along with small solar panels and anything else of perceived value including the new wiring loom being cut out. The vessel was boarded twice possibly three times over a few of days. Other local sailors did not think it important to make a report to your site. However I let anyone know who would listen just as a warning, I wish I had been aware of your site before now. Thank you for your time running your site. Not reported to authorities. At 0200 hrs the only cruising yacht at Marina ZarPar (mooring) was boarded by 2 individuals with knives. They threatened the crew and demanded cash, which they took, leaving the crew uninjured before jumping overboard to escape. Radio calls to the CG and Marina went unanswered. A report was made to the marina the next day. Left boat in the morning returned in the evening. Apparently they were mainly looking for money and credit cards that were not on board. It appeared that they were in a hurry and did not have many hands to take other stuff. It's very likely they just swam to the boat either from the beach or from the island. Early morning - items taken not known as boat was total loss ($250,000) from fire. Dinghy later found in mangroves with knife holes. 2 in custody, 1 still loose. One of 12 incidents in 2012. Took 3 computers and 2 cameras; boat then moved into marina for better security, reported. Only fenders disappeared but that's still theft. Lucky we have dogs because it could have been more than just feders. Not reported to local authorities. An experienced and well traveled female single hander was anchored offshore Petit Paradise for about a week, and had been befriended by the locals. On May 11, she had just gone to sleep at around 9PM when she was boarded, viciously attacked, and robbed by 3 armed men who tied her up, beat her, and finally left when they became nervous about being discovered. She later made her way to the village, sought and received assistance and was treated at the medical clinic. Reports were made to the local police, French Embassy, Belgian Consul, and local judge. She has shared a detailed description of the event and it is published on the Noonsite Piracy pages, and can be viewed here http://www.noonsite.com/Countries/Haiti/haiti-grand-goave-petit-paradis-night-time-robbery-and-violent-attack-2013-may-2015 CSSN NOTE : This is the THIRD violent assault against a cruiser reported from Haiti this year. The other reports can be viewed herehttps://wp.me/p3QFio-Da and herehttps://wp.me/p3QFio-CD and here https://wp.me/p3QFio-CE. cash, solar panles,computers,navigation electronics, etc. An Australian couple aboard their sailboat en route from Cuba to Ile a Vache Haiti anchored overnight near Petit Port a Piment , Haiti . At approximately 11 PM it was boarded by 10-15 men armed with clubs, sticks and machetes. They cooperated with the attackers and offered everything, but they were violently assaulted. The captain was beaten badly, resulting in broken bones and machete wounds. His wife sustained significant injuries also. The steering compass was intentionally damaged/disabled. The next day local police arrived and both were taken to a local hospital where they received treatment, and the husband confined for several days. Various officials provided assistance and the damaged boat was taken by a delivery captain to Ile a Vache, Haiti. The captain and his wife returned to Australia where their injuries were re-assessed, and they received additional medical care. All Cash ( $1000 US ), laptops, diving equipment, etc. Owners returned to their locked dinghy at the Esperanza community dock and found that 20HP engine (also locked to the dinghy) had been cut from the transom, while at the dock. The locked dinghy remained, but thieves had sawed through the clamping bolts and stolen the engine . A police report was made. A dinghy was cable locked through a cleat on the Fishermans pier. Thieves used tools to remove the cleat from the dock. A police report was made, and the police indicated this was the second dinghy theft reported to them that week. The dinghy was recovered, minus the outboard, the next day at the nearby Esperanza pier. Owners returning to their yacht berthed near the marina restaurant discovered that their dinghy/outboard had been stolen. The dinghy was lifted and well secured on davits, but was not locked to the yacht. A report was made to the marina, coast guard and the police. Between 6-8 PM while the owners were onboard, a yacht moored in Isabel Segunda had the cable/locks to their in-the-water and locked 10 ft. RIB/15 HP Yamaha outboard cut, and the outboard was stolen. The owners did not hear any disturbance and made a report to the police the next morning, but were refused a copy of the written report. CSSN NOTE: This is the sixth report of theft from Vieques in 2017, and the first this year from Isabel Segunda. The thieves operating in Vieques are well prepared and seem beyond the interest or reach of authorities there. If you choose to visit Vieques, best practices are called for, LIFT and LOCK (securely) dinghies when not in use. An in-the-water and not locked dinghy was stolen from an anchored yacht overnight. The outboard was removed and the dinghy set adrift. It ended up beating against the rocks and was found unsalvageable the next morning, the fuel tank and life jackets were recovered. A police report was made, but victims describe the police as “unhelpful”, and no incident report was provided. CSSN NOTE: This is the second report for this same night in this bay, see the prior report HERE. 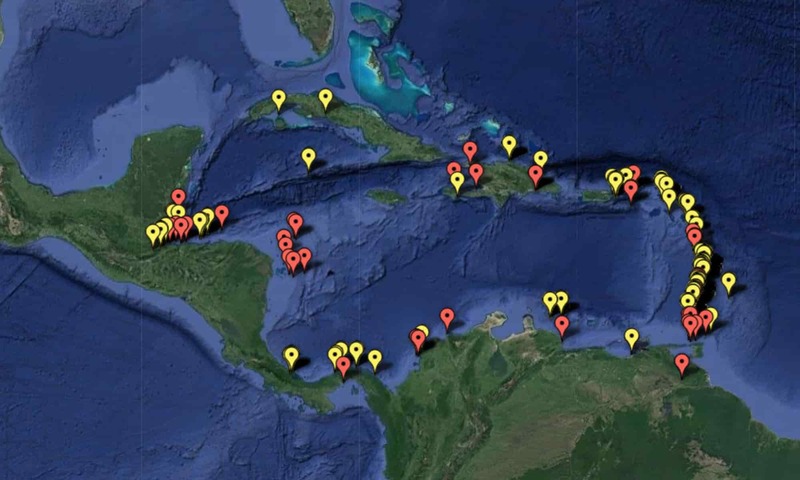 There have been 5 thefts reported to CSSN in Esperanza so far in 2017, and police indicated there were several other (not reported to CSSN) dinghy/outboard thefts as well. Thieves operating in Esperanza are vigilant and well prepared, using large bolt cutters on well secured dinghies and trailers when required. Police there have not proven effective at controlling the persistent problem. A yacht anchored in Sun Bay had its in-the-water and unlocked dinghy stolen overnight while the crew (and dog) slept. The dinghy was recovered the next morning swamped near the beach, minus the outboard which had been securely locked with a solid bar across the transom clamps. The thieves had used a 2x4 to sever it from the dinghy and apparently left by land vehicle. The fuel tank line was cut in 2 places and the tank was taken as well. A report was made to the local police. There were 6 other boats anchored in the bay that night, and one other had its dinghy/outboard stolen as well. CSSN will publish another report when those details are received. At approximately 8 PM cruisers returned to the dinghy dock on the old pier in Esperanza, and discovered their dinghy/outboard had been stolen. The dinghy was chained to the dock with 3/8” stainless steel chain and locked with a case-hardened lock, the outboard engine was similarly chained and locked to the dinghy. The dinghy minus the outboard was found just off the beach to the east of the dock with both chains and one of the locks cut with a bolt cutter. A police report was made and victims were informed by the local police that this was the 4th motor theft this week. The owners indicate the police took little interest in assessing the situation - writing down little, looking at the dinghy or the area where it was left and they took no photos. The owners believe that well prepared theives with large bolt cutters are actively operating in the area and advise extra precautions. A yacht anchored in Sun Bay and the crew went ashore there for a few hours, securing their dinghy on the beach. A kayak/paddle and snorkel gear were left (but not secured) as well. When the yacht owners returned after a few hours in town, the kayak/paddle/snorkel gear had been stolen. Reported to a local businessman, who made a VHF announcement. No police report was made. Owners were later told 5 commercial paddleboats had also been stolen from this same area. Dinghy was securely chained and locked to the pier while crew was ashore. One of the lifejackets was found next to the ramp adjacent to the pier. The well-tooled thieves apparently used a trailer to remove the dinghy after cutting the chain. A report was made to the police, who were descibed as indifferent to this continuing problem. CSSN NOTE: This is the 3rd reported incident at this location in the last month. Around 11:30 PM 2 young men rowed out to an anchored yacht and attempted to steal the (locked to the yacht with cable) dinghy. They were clumsy, and scared off by the owner who was on board. They left behind their bolt cutters. An unoccpied vessel was boarded and broken into overnight, the theives cut locks and cables. The outboard was locked/cabled to the rail, and other items were taken from inside the locked cabin. A police report was made. November 30 in Vieques Rompeolas, burglars eneterd the boat at night got away with many items. The burglers seemed to have left in a hurry because they spent time removing the anchor and rode and then left rode on deck and anchor in the water, there were more jackets inside and other things they could have taken. Reported to police. The hired minder of a boat in dry storage in Puerto del Rey discovered locks were compromised on the stern lazarette and external companionway doors. Nothing was taken from the lazarette and apparently thieves couldn't get into the cabin. It is not known if other yachts in the storage area were similarly affected. The minder was informed that several outboards had been stolen from other stored yachts approx. 10 days prior, by person(s) unknown, but were later recovered inside the yard. This incident was reported to marina/boatyard management. Dinghy and outboard stored in secure marina area for repair. Lock to outboard cut. Several others stolen during same time frame - see news page for a few details.